Machine learning support in commons-math currently provides operations to cluster data sets based on a distance measure. KMeans++: It is based on the well-known kMeans algorithm, but uses a different method for choosing the initial values (or "seeds") and thus avoids cases where KMeans sometimes results in poor clusterings. KMeans/KMeans++ clustering aims to partition n observations into k clusters in such that each point belongs to the cluster with the nearest center. Fuzzy-KMeans: A variation of the classical K-Means algorithm, with the major difference that a single data point is not uniquely assigned to a single cluster. Instead, each point i has a set of weights uij which indicate the degree of membership to the cluster j. The fuzzy variant does not require initial values for the cluster centers and is thus more robust, although slower than the original kMeans algorithm. DBSCAN: Density-based spatial clustering of applications with noise (DBSCAN) finds a number of clusters starting from the estimated density distribution of corresponding nodes. The main advantages over KMeans/KMeans++ are that DBSCAN does not require the specification of an initial number of clusters and can find arbitrarily shaped clusters. 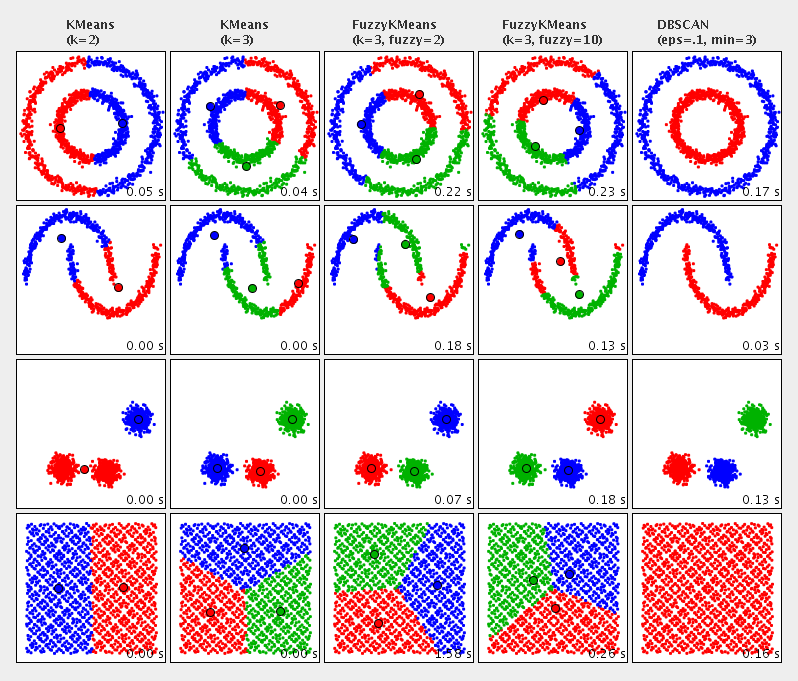 Multi-KMeans++: Multi-KMeans++ is a meta algorithm that basically performs n runs using KMeans++ and then chooses the best clustering (i.e., the one with the lowest distance variance over all clusters) from those runs. Here is an example of a clustering execution. Let us assume we have a set of locations from our domain model, where each location has a method double getX() and double getY() representing their current coordinates in a 2-dimensional space. We want to cluster the locations into 10 different clusters based on their euclidean distance. Now we will create a list of these wrapper objects (one for each location), which serves as input to our clustering algorithm. Finally, we can apply our clustering algorithm and output the found clusters. // initialize a new clustering algorithm. // we use KMeans++ with 10 clusters and 10000 iterations maximum. // we did not specify a distance measure; the default (euclidean distance) is used.